Please don’t miss the Johnston County Heritage Center’s 14th annual Historical Ghost Walk on October 25, starting at 6:30 pm beside St. Paul’s Episcopal Church, corner of Second and Church Streets in historic Downtown Smithfield. This event gets more popular each year, so be forewarned if you arrive between 6:30 and 7:30 there may be a bit of a wait. The line is usually not so long after 7:30 (hint-hint!). Regardless of your arrival time, while you wait there will be someone to share stories and fun facts about Johnston County’s fascinating and sometimes checkered past. 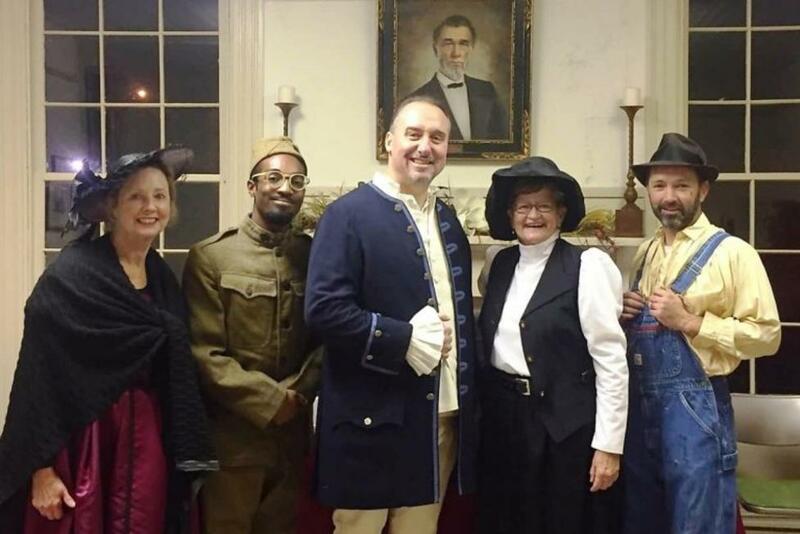 This year John Lawson (portrayed by Neuse Little Theater veteran Shaun Braswell) is making his first appearance in Smithfield since his untimely demise over 300 years ago. Lawson was a young English noble who came through this area in 1701 when most of North Carolina was still inhabited by native peoples. He kept a journal during his Carolina sojourn and published it in London in 1709. The Heritage Center actually has a first-edition copy of the book on display in the Holding-Richardson Exhibit Hall on first floor. We also have a reprint edition by UNC Press which you can buy after Ghost Walk in the Hastings House. Also appearing in Riverside Cemetery will be Miss Susan Hayes (portrayed by Rachel Dennis, another NLT veteran), and her student Mattie Thomas (portrayed by Elom Lewis, who recently performed in Clayton Youth Theater’s production of Bye Bye Birdie). Miss Hayes was only in her 20s when she came here from New England just after the Civil War to teach former slaves. The 1869 two-room schoolhouse where she taught and where Mattie attended is still standing, and an effort is underway to restore it and open it to the public for tours. It is the only freedmen’s school known to be left in North Carolina and one of only a few nationwide. Florence Massey Parker (portrayed by NLT actress Theressa Rose) was a victim of the flu epidemic that claimed the lives of millions worldwide in the fall of 1918 around the end of World War I. Mrs. Parker is the only ghost this year whose remains actually rest in Riverside Cemetery. Charlie Straughan, a Selma police officer (portrayed by Officer W. T. Faircloth, Smithfield PD), was an eyewitness to the “Catch-Me-Eye Explosion” in 1942. When a car collided with a truck near Selma just after midnight, no one (except the truck driver, perhaps) had an inkling that truck was carrying enough explosives to sink over a dozen battleships! Folks over about a 50-mile radius found out soon enough. Last, but certainly not least, will be an appearance by the venerable Sam Narron (portrayed by his son Richard “Rooster” Narron). Mr. Narron was one of Johnston County’s ten Major League Baseball players. He was a catcher for the St. Louis Cardinals in the 1930s and 40s and later coached a team that played in the World Series. After leaving the cemetery, there will be refreshments and things to see and buy in the Hastings House, where Confederate Generals were headquartered during the Civil War. Admission cost is $5 for adults, $3 for students (grades K-12), and kids under 6 get in free. Tickets are NOT sold in advance, and tours are offered on a first-come-first-served basis. I hope to see you at the cemetery! Todd Johnson is Executive Director of the Johnston County Heritage Center, the county’s official local history museum and library. From 2011 to 2014 he was director of the Ava Gardner Museum and now serves on the museum’s Board of Directors. Todd holds degrees from Campbell University (B.A. in history, 1986; M.A. in Christian Ministry, 2015) and North Carolina State University (M.A. in Public History, 1991) and is author of a number of books on Johnston and Wake County history. He has been a church musician at several congregations in Johnston and Wake Counties, currently serving as Minister of Music and Organist at Benson Baptist Church. Todd is married to the former Donna Barfield of Garner, and they have three adult children, Abby, Cliff, and Kevin. They live in the Woodall-Fleming House (circa 1870) in Smithfield’s Brooklyn Historic District.